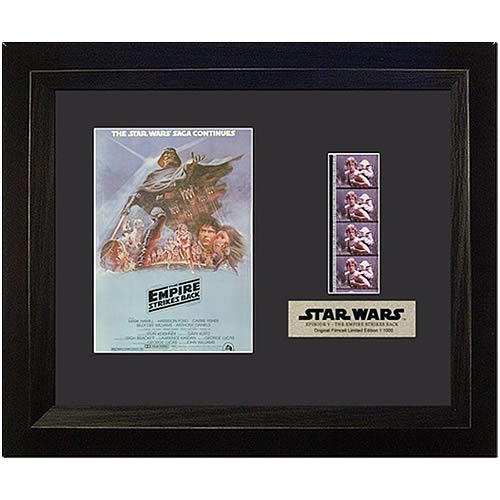 The Star Wars Empire Strikes Back Film Cell features a classic poster as well as a clip of film frames from Episode V of the classic sci-fi series! Limited to 1,000 pieces, this is sure to be a must-have item in your home or office. In George Lucas' spellbinding "Star Wars" sequel, the battle to save the galaxy from the evil Darth Vader rages on. Han Solo (Harrison Ford), Princess Leia (Carrie Fisher) and Chewbacca are tested in a devastating attack by the Imperial army and its AT-AT Walkers. Meanwhile, Luke Skywalker (Mark Hamill) seekss out the ancient Yoda to learn the screts of the Jedi . . . secrets Luke will need when the Dark Side of the Force beckons him in a destiny-defining duel with Darth Vader.